Our collection of designer topiaries isn’t comprehensive without the addition of our voluptuous English ivy topiary ball centerpiece with miniature beaded fruit topiary accents. This enchanting ivy topiary centerpiece exhibits the grace and charm of the English gardens topiary. We’ve crafted our formal gardens English Ivy topiary ball to showcase the gardening proficiencies and iconic refinement of the late Elizabethan classical topiary. This artificial ball topiary centerpiece boasts a sublime combination of English ivy silk topiary plant florals and beaded fruit topiary accents. 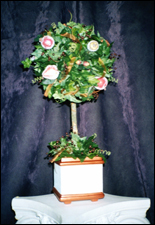 We’ve formed lush, miniature silk topiary trees of English ivy and punctuated these silk topiary plants with decorative fruits, berries and chic copper ribbon accents interwoven throughout the artificial ball topiary. This classic English topiary tree stands proudly on a natural wood stick and sits in a lush gathering of floral silks that top our hand painted ceramic designer base. Purchase our voluptuous English ivy topiary ball for a dazzling floral focal point or a stylish silk topiary wedding centerpiece; or consider a dazzling pair or grouping of these designer topiaries for elegant interiors or stunning wedding topiary centerpieces to impart plenty of southern charm’z’ panache!